Welcome Adora, Nicole, Elizabeth, Case and Robby! We're excited to announce a few new additions to the YC team. Adora Cheung is joining YC as a Partner. Previously, she was co-founder and CEO at Homejoy and a product manager at Slide. Adora has a masters in economics from University of Rochester and a bachelors in computer science from Clemson. Nicole Imhof is joining YC as my Executive Assistant. Prior to YC, Nicole was an Operations Associate at the Berkeley Endowment Management Company and previously, she was at ICONIQ Capital. Imhof earned her B.A. in Politics from the University of San Francisco. Elizabeth Proehl is joining YC Research to manage the office and general operations. Most recently, Elizabeth worked as a public radio producer and reporter at KPFA in Berkeley, California. She has a BA in Near Eastern Studies and Psychology from Cornell. Case Sandberg is joining YC's software team. Previously, he was an early employee at both Respondly and Borrowlenses (with exits at Buffer and Shutterfly, respectively). Case is a high-school dropout. Robby Walker is joining YC as a part-time partner and will lead YC's non-profit program. Robby previously founded two companies funded by Y Combinator: Zenter (W2007) and Cue (W2010). He now works on Siri at Apple. Elizabeth Rhodes is joining Basic Income Project as our Research Director. She recently completed a joint PhD in Social Work and Political Science at the University of Michigan, where her research focused on health and education provision in slum communities in Nairobi. We received over 1000 applications for this position (including tenured professors from Oxford, Columbia, and Harvard), and Elizabeth stood out as the right candidate based on her aptitude and her ambition. We’re very excited to work with her. We want to run a large, long-term study to answer a few key questions: how people’s happiness, well-being, and financial health are affected by basic income, as well as how people might spend their time. But before we do that, we’re going to start with a short-term pilot in Oakland. Our goal will be to prepare for the longer-term study by working on our methods--how to pay people, how to collect data, how to randomly choose a sample, etc. Oakland is a city of great social and economic diversity, and it has both concentrated wealth and considerable inequality. We think these traits make it a very good place to explore how basic income could work for our pilot. It’s also close to where we live, which means we’ll be closer to the people involved. We think our local resources and relationships will help us design and run this study effectively, and we hope that will enable us to produce the best research possible. In our pilot, the income will be unconditional; we’re going to give it to participants for the duration of the study, no matter what. People will be able to volunteer, work, not work, move to another country—anything. We hope basic income promotes freedom, and we want to see how people experience that freedom. If the pilot goes well, we plan to follow up with the main study. If the pilot doesn’t go well, we’ll consider different approaches. We think everyone should have enough money to meet their basic needs—no matter what, especially if there are enough resources to make it possible. We don’t yet know how it should look or how to pay for it, but basic income seems a promising way to do this. One reason we think it may work is that technological improvements should generate an abundance of resources. Although basic income seems fiscally challenging today, in a world where technology replaces existing jobs and basic income becomes necessary, technological improvements should generate an abundance of resources and the cost of living should fall dramatically. And to be clear: we think of basic income as providing a floor, and we believe people should be able to work and earn as much as they want. We hope a minimum level of economic security will give people the freedom to pursue further education or training, find or create a better job, and plan for the future. We’ll be spending the next few months designing the pilot, and we welcome any input to help us do the best job possible—especially from the Oakland community . And again, we hope to follow-up with a long-term study on how people’s happiness, well-being, financial health, and time are affected. If you have thoughts on either, please get in touch at basicincome@ycr.org. We’ve already been connecting with Oakland city officials and community groups for feedback, but we’re planning to host some public events in Oakland to get more voices involved. Details to come. Starting today you can sign up for June, July and August YC Open Office Hours. What are Open Office Hours? Learn more here. All founders are wel­come to apply. Each com­pany who par­tic­i­pates will get 25-minute of­fice hours with a YC part­ner. You can do them in per­son at our of­fice in Moun­tain View, CA or re­motely on Skype. Star­tups should use these of­fice hours to fig­ure out con­crete steps they can take to build their MVP (min­i­mum vi­able prod­uct), re­cruit a co-found­ing team, raise seed cap­i­tal, launch, mar­ket their prod­uct, and ac­quire their first cus­tomers. Ad­di­tion­ally, Ama­zon is gen­er­ously of­fer­ing $5k in AWS credit for all par­tic­i­pat­ing teams. Questions? Send them to openofficehours@ycombinator.com. Want to help us spread the word? Email kat@ycombinator.com and michael@ycombinator.com. With companies increasingly doing business across multiple cities and countries from day one, video conferencing is key. But video conferencing hardware is notoriously bulky, expensive, and designed for companies with full-time IT teams that can handle set up and management. Startups and smaller businesses are left behind, crowding around a single laptop during team meetings, investor pitches, and sales demos. Pluot is a company that launched out of our Winter 2016 class that makes small, easy-to-set-up video conferencing hardware that just works, and that any company can afford. The company's mission is to democratize video conferencing -- to put useful, beautiful, simple video conferencing into every workplace in the world. Setting up a Pluot takes just five minutes, and starting or joining a Pluot meeting takes ten seconds. Pluot hardware is free. Customers just pay $50/month per Pluot box, with no limit on users, minutes, or meetings. Pluot's founders, Doug and Kwin, have known each other for 20 years, worked together for 15, and been obsessed with video conferencing and collaboration for a decade. Doug and Kwin bootstrapped Pluot by designing high-quality hardware that can be manufactured in small quantities. The company assembles Pluots in a garage in San Francisco. We’re excited to announce YC Research’s newest project: the Human Advancement Research Community (HARC). This came out of a conversation that started between Alan Kay and me more than a year ago about how to invent future computing technologies; I’m delighted to finally be officially working with him and his group. He is one of the smartest people I’ve ever met. HARC’s mission is to ensure human wisdom exceeds human power, by inventing and freely sharing ideas and technology that allow all humans to see further and understand more deeply. In partnership with Infosys and SAP, HARC is starting with 20 of the top researchers in fields related to human learning and understanding, many of whom previously worked in SAP’s Communications Design Group. They include Principal Investigators (in alphabetical order): Vi Hart, Dan Ingalls, John Maloney, Yoshiki Ohshima, Bret Victor, and Alex Warth. We will share more detail about each PI’s current projects once we settle into our new roles and establish a web presence. HARC will be chaired by Patrick Scaglia, who has spent his career leading similar long-term research initiatives. Alan Kay and Patrick will jointly contribute to the group’s strategic vision. Chris Clark will run the group operationally (along with YCR’s other groups). The Advisory Board includes Patrick Collison, Adele Goldberg, Alan Kay, Vishal Sikka, and Tanja Rueckert. Special thanks to Infosys, SAP, Sam, Alan, and Patrick for their generous support and hard work creating HARC, and we look forward to sharing more about our research in a few weeks. As more and more brands release products with extremely limited availability, consumers have resorted to camping out, spending hours in digital queues, or paying upwards of 400% over retail for coveted items like limited edition sneakers and apparel. Restocks is a company that launched out of our Winter 2016 class that does all the hard work of finding he most in-demand items, with a subscription service which alerts users of the availability of popular but hard-to-find products. Restocks has created the first central place where stock information is stored and pushed out to the people who care most about it, with software that tracks 45,000 products in real time. "Over the past couple of months, I’ve purchased more items through Restocks than any other mobile commerce app aside from Amazon. And I’d wager that aside from a couple of statistical outliers each of those purchases were for more money on average. Restocks is the answer to a simple question: What if you could target the world’s most ravenous purchasers at the exact moment they’re most likely to buy some of the world’s most sought after products? 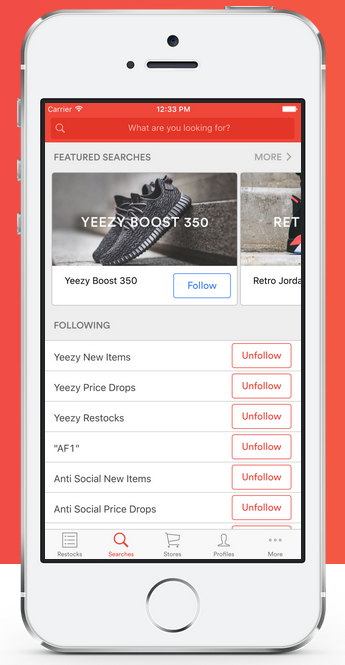 Restocks is app that drives purchasing via push notifications when highly anticipated shoes and streetwear brands (for now) release or re-stock items. It’s also cost me hundreds of dollars over the few weeks I’ve been testing it. From limited release Nike shoes to boutique brands like Supreme, Reigning Champ, Concepts and Kith — each purchase is a push notification and a couple of taps away. Restocks is on my home screen. Amazon isn’t even home screen worthy." Read the full article here, and check out Restocks here. Today, Y Combinator announced its intent to acquire Sequoia Capital. This deal is still pending regulatory review and a successful pitch by Sequoia managing partner Doug Leone on YC Summer 2016 Demo Day. We’re not disclosing the financial terms, but Sequoia's ownership of YC-backed companies will pass to us, so I’ll just say we're once again the largest outside shareholders in Airbnb, Dropbox, and Stripe. Sequoia Capital has had an Incredible Journey being the leader in venture capital investing in Silicon Valley for most of the last 40 years. They have partnered with iconic companies like Apple, Google, Yahoo, PayPal, YouTube, LinkedIn, and WhatsApp. The acquisition will enable our firms to realize a number of operational synergies. We have a blog and Sequoia doesn’t. Sequoia’s day-long Monday partner meetings will be replaced with Tuesday night dinners. And now YC companies will automatically receive a Sequoia term sheet to negotiate better terms from other firms. Sequoia will become the new YCVC group*, where they will take a hands-on role of turning YC’s best companies into enduring franchises, which they have been doing anyway. The combined entity will officially be called “Sequoia Combinator”, but will do business as “YC”, as brevity is very important to both organizations. The new YC logo will be changed from orange to green as it is the color of sequoia leaves and money. Sir Michael Moritz will become chairman and also return to his journalistic roots as editor of Hacker News. Sequoia will help launch YC China, YC India, and YC Israel, and YC Forestry, which will be focused on preservation of sequoia trees worldwide. We are so excited for the future! *Sequoia LPs will have 30 days to export their data. Congratulations to the Fellowship teams who presented at the first Fellowship Virtual Demo Day! If you're an accredited investor who would like access to the Fellowship's Virtual Demo Day contact fellowship@ycombinator.com. Anyone who has used a catering service for meetings or corporate gatherings can explain how frustrating the entire process is. What seems like a simple task actually involves searching through various vendors, determining dietary restrictions, planning logistics, and invoicing the order. 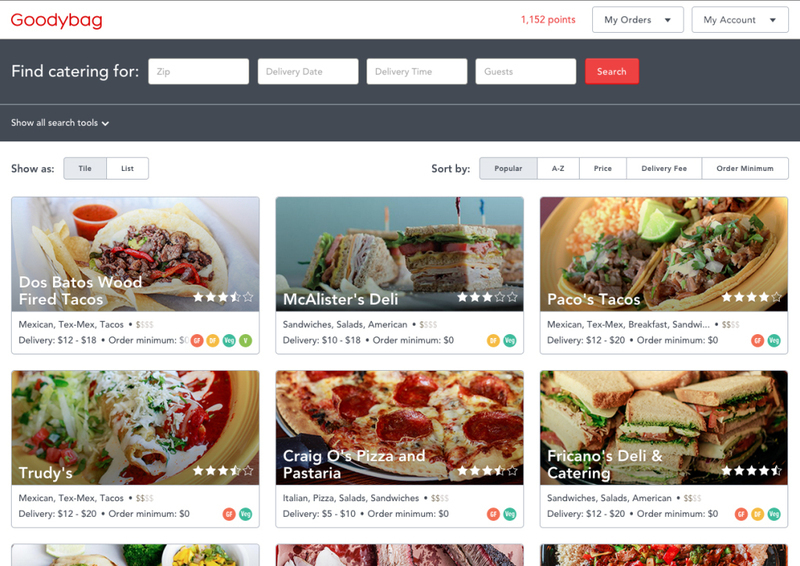 Goodybag is a company launching out of our Winter 2016 class that streamlines the corporate meal-ordering process. Anyone can log onto the site and browse through local caterers before ordering online. In addition to ease of use, Goodybag also offers live customer support. Unlike other on-demand food delivery services, Goodybag does not actually deliver anything. Rather, it is a self-serve marketplace that allows companies to compare and book meals for specific events. Because of this, Goodybag can scale rapidly without being lost in unit economics. The three behind Goodybag are Jay Panchal, Om Panchal, and Jag Santha. Jay Panchal and Jag Santha met in college at Georgia Institute of Technology while studying Systems Engineering. Om Panchal, Jay's brother, studied Biology at Southwestern University. Goodybag has done over $5.5M in orders from just the Austin, Houston, Seattle, and Nashville area. Learn more about Goodybag here.